This classic textbook, now in its fourth edition, offers anthropology students a succinct, clear, and balanced introduction to theoretical developments in the field. The key ideas of 25 major theorists are briefly described and—unique to this textbook—linked to the biographical and fieldwork experiences that helped shape their theories. The impact of each scholar on contemporary anthropology is presented, along with numerous examples, quotations from the theorists' writings, and a description of the broader intellectual setting in which these anthropologists worked. Moore has updated many of the profiles to take into account recent scholarship. The book is also more strongly tied in to the companion work,Visions of Culture: An Annotated Reader, to encourage the fullest intellectual engagement for students.The Visions of Culture Value Pack is available when you order directly from AltaMira Press. Order these two books as part of the Visions of Culture Value Pack using a single isbn for a 20% discount! Click here to order online.Includes:1. 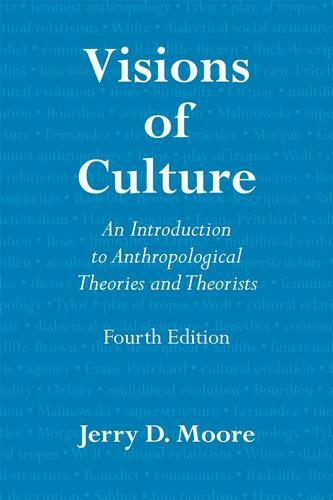 Visions of Culture:An Introduction to Anthropological Theories and Theorists Fourth EditionJerry D. Moore2012 2. Visions of CultureAn Annotated Reader Jerry D. Moore2009Find full information on the contents of the reader here.